Christian Publishing House, 9781945757488, 132pp. Herein Andrews will give the reader exactly what the Bible offers on exposing who the Antichrist and the Man of Lawlessness are. If we look at the texts that refer to the antichrist and the man of lawlessness, we will have lines of evidence that will enable us to identify them. 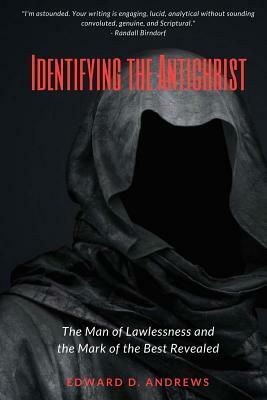 Why is it important that we know who the antichrist and the man of lawlessness are? The antichrist and the man of lawlessness have had a greater impact on humanity and Christianity over the past centuries than many know. Moreover, the influence on the true worshipers of Christianity today has been even more significant and will only go from bad to worse as we come closer the second coming of Christ. Let us offer an analogy to make the above point, even more, impactful. What would we do if a deadly outbreak of a disease that is spreading more quickly and more extensively among the people than would normally be expected and it is raging in our country, especially within our city, right in our community? Would we not look for a way to build up our immune system? Would we not also want to avoid anyone carrying the disease? The same holds true of the antichrist and the man of lawlessness, who not only have the ability to take our physical life but also our eternal life. Therefore, in a Scriptural sense, we would want to build ourselves up spiritually and avoid anyone who is affected by these evil ones, not to mention the antichrist and the man of lawlessness themselves. The Scriptures tell us "the antichrist, of which you have heard that it is coming, and now it is in the world already." (1 John 4:3) Still staying with the analogy, if we want to avoid being infected, we have to identify the antichrist/man of lawlessness and the carriers of the disease. This publication will accomplish just that and do so Scripturally. Nothing herein will be based on an opinion; it will all be God's Word. The first four chapters will cover the Antichrist. Chapters 5-6 will deal with the Man of Lawlessness. The apostle Paul tells us "Then the lawless one will be revealed, whom the Lord Jesus will do away with ..." 2 Thessalonians 2:8] In addition, Chapter 7 will identify the Mark of the Beast from the book of Revelation.